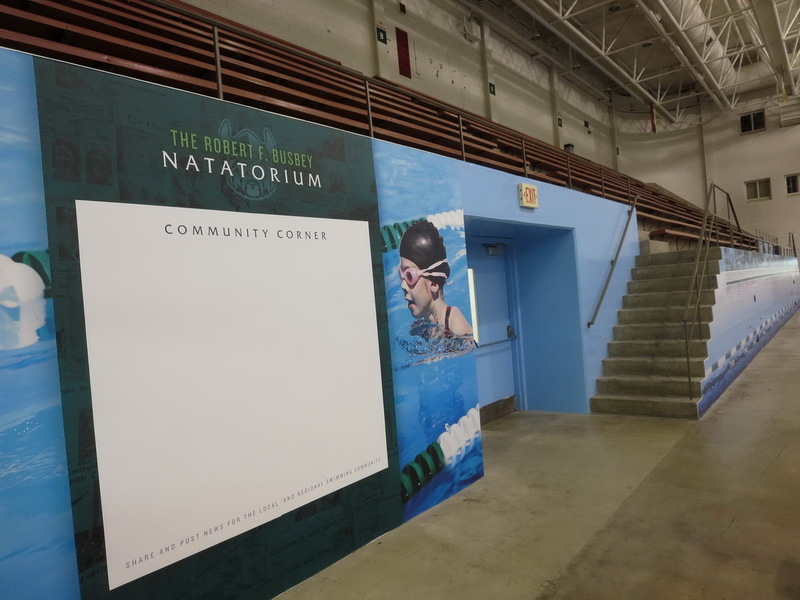 Thanks to phenomenal support from connected swimming and diving alumni, The Robert F. Busbey Natatorium looks newer today than when it was new 40 years ago. 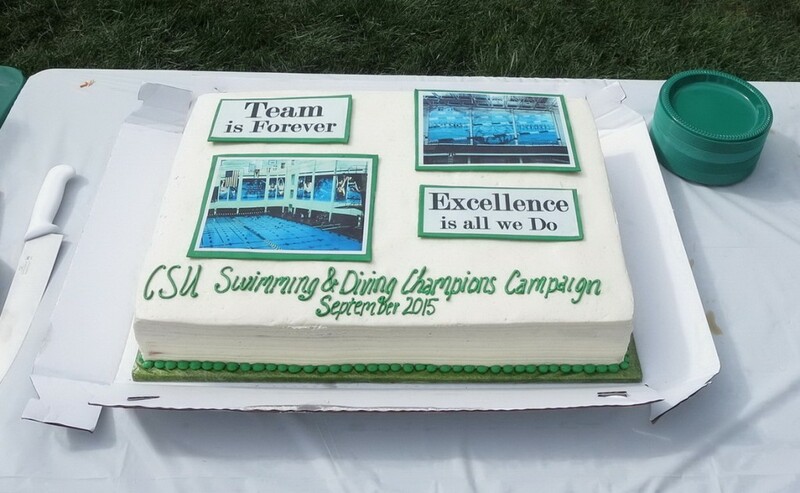 Here’s an update from the September 26, 2015 Champions Campaign Dedication. The star of the dedication was of course the new pool. The North and West wall graphics feature 80 years advice from two great coaches: Bob Busbey and Wally Morton. 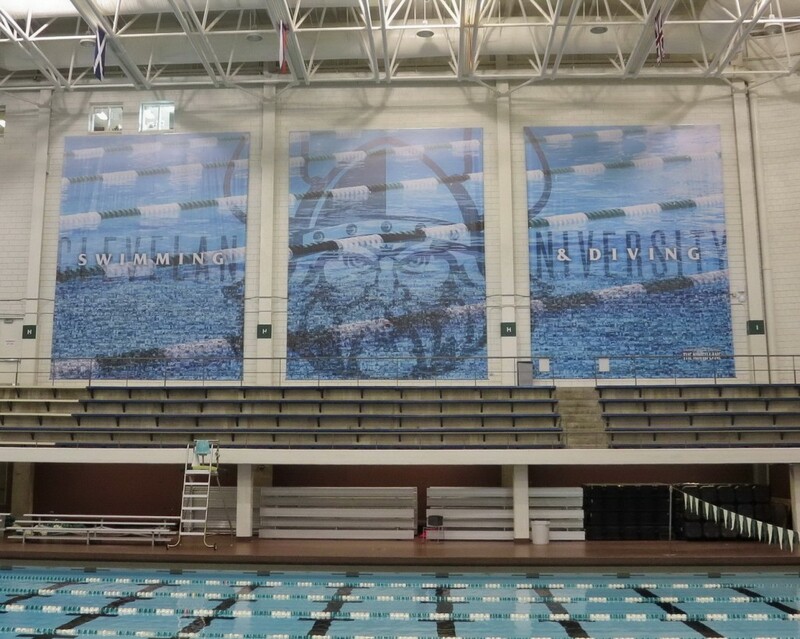 The Ninth Lane Banner highlighted Magnus watching over and motivating our teams while honoring alumni with thousands of photos – each with its own story. 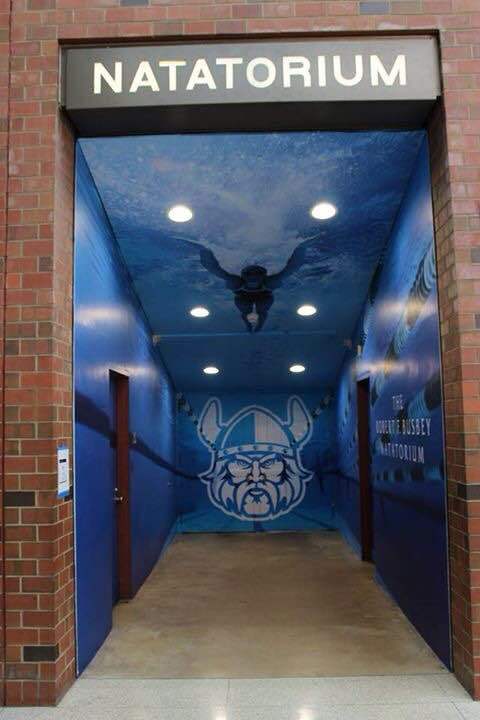 This was clearly the “go to” location where swimmers, spectators and alumni congregated to look for “their story”. We hope this will be the source of many “selfies” which will in turn create even more stories. The neatly wrapped video screen and brand new lane timer provide state-of-the-art timing capabilities. Installers from Colorado Timing have commented this is one of the best “wraps” they’ve seen. New bottom paint and nearly invisible water add to the feeling of “new”. 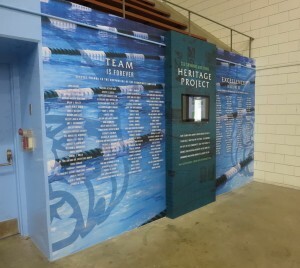 Nine decades of team Heritage surrounds the pool with Championship Banners and record boards. 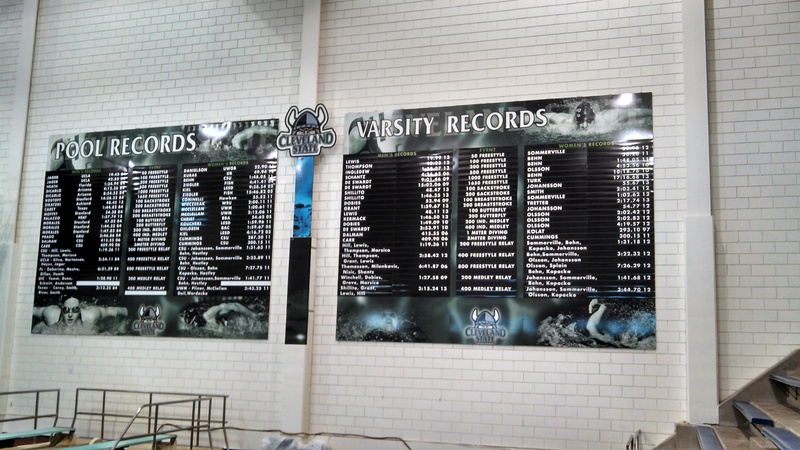 The Timeline Wall boldly displaying team accomplishments in the pool, classroom and community. With room for another 24 years, which happens to correspond to CSU’s 75th anniversary, this area was designed to grow with the team over time. 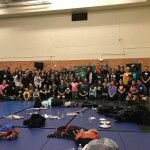 The Community Corner highlights CSU neighborhood partners. We hope this area, clearly visible from the Rec Center, will become a “posting place” for all who use the pool or plan events for the pool. 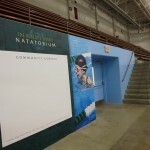 Behind the Community Corner and Timeline Wall and East bleachers is the main entrance to the pool from the lobby. Visitors can’t help but expect an explosion in graphics based on the bold 3-D surround entryway. 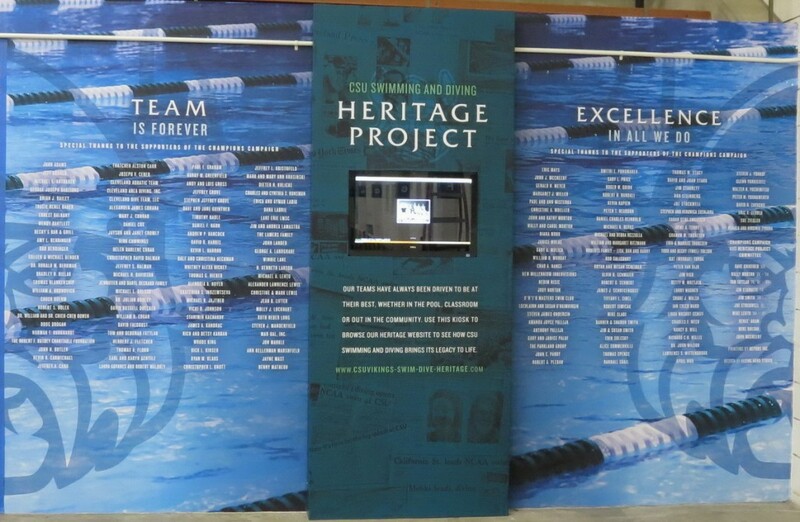 The Heritage Corner interactive kiosk brings team history to life for those in the pool and everyone world-wide. 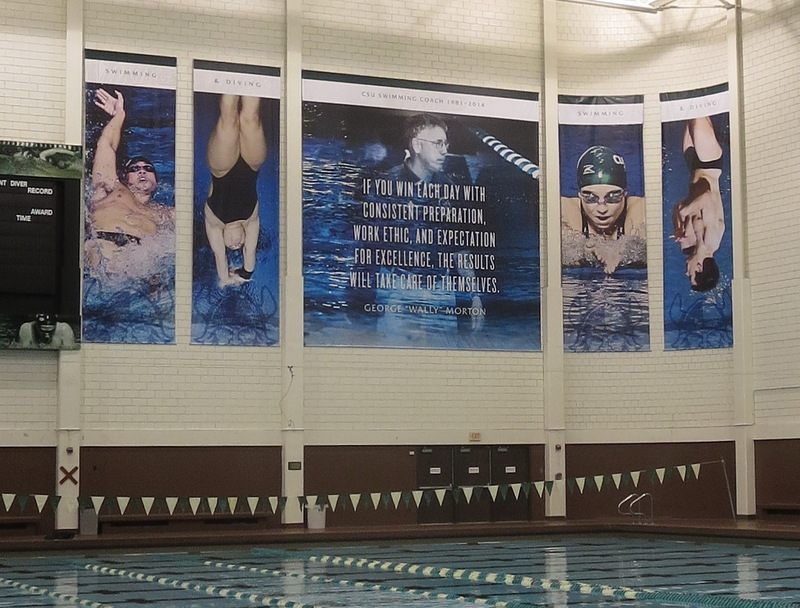 The two donor panels shout out THANK YOU to the 183 friends and alumni who made Wally’s dream of capturing the program’s history and posting team pictures in the pool come true. Members of the Champions Campaign and Heritage Project committees are shown next to the donors. 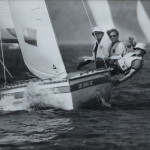 Wally & Joe launched the Champions Program in 2009 along with Jim Smith and Mike Dolzak. 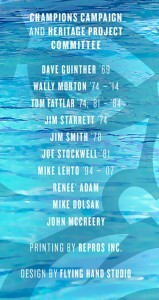 Mike Lehto, Tom Fattlar, Jim Starrett, John McCreery, Renee Adam and I signed on to complete the Heritage Project. 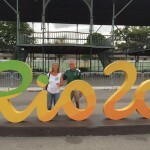 Coach Paul Graham joined last year. 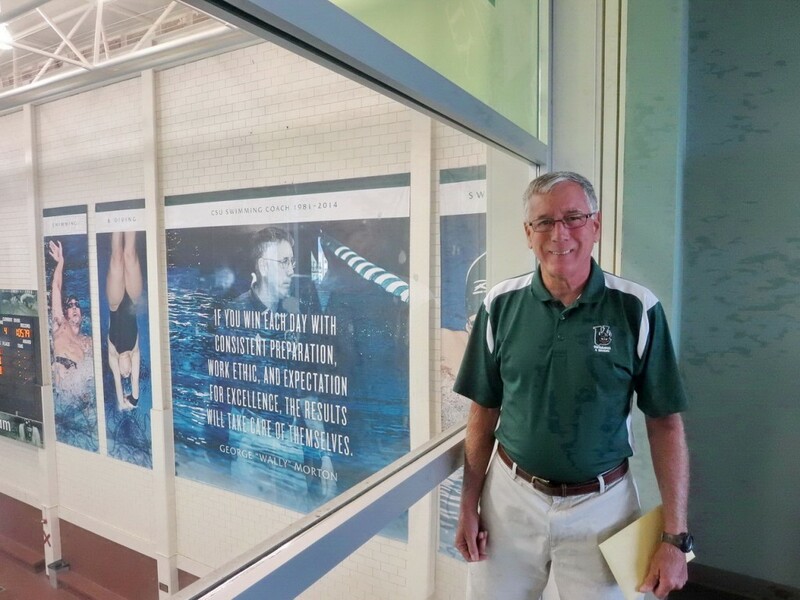 Without John Parry’s support and President Berkman’s commitment to CSU swimming and diving, the pool bottom would not be shiny white and the water would not be crystal clear. Flying Hand Design studios sat with us in the pool, listened and carefully noted our objectives for each heritage element, and then captured our visions in bold style. Repros Inc. brought them to life. And did so within a very aggressive budget and in a time frame that was often measured in days not weeks (and even hours !). Thank you Repros for your team’s expertise and dedication to the Heritage Project. John Parry was MC for Saturday’s ceremony. Coach Paul Graham stressed the “three C’s” embodied in the day’s events. 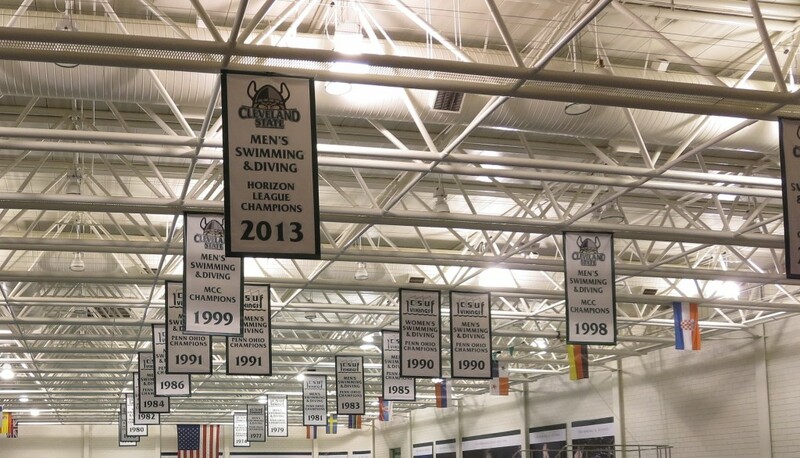 He laid out the importance of CONNECTIONS, the CELEBRATION enabled by the time, treasures and talents of the many alumni involved, and the importance of the decades-long CLEVELAND STATE UNIVERSITY heritage as part of CSU swimming and diving proud history and bright future. President Berkman thanked the swimming and diving alumni for reinforcing the importance of student athletics to the university and community. 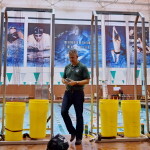 He highlighted the team’s history of innovation, from the design of the pool and pioneering strength training to global recruiting and local connecting. The President also held up the team’s philanthropy and use of technology to stay connected as an example of best practice for CSU athletics and academics as well as colleges and universities across the nation. In closing John Parry reminded everyone that “Tradition Never Graduates”. 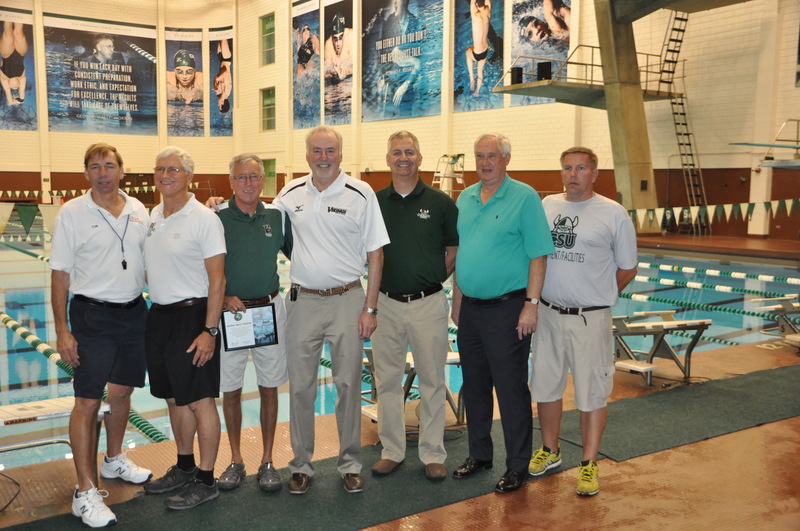 Bob’s and Wally’s roles in cementing the Fenn/CSU swimming and diving program, figuratively and literally, have been huge and unprecedented. 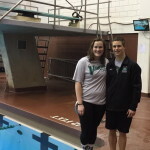 No program in swimming and diving history has benefited more from two individuals than ours. “Wally – You defined who we are as true Vikings. You expanded the program with unparalleled loyalty to Bob. 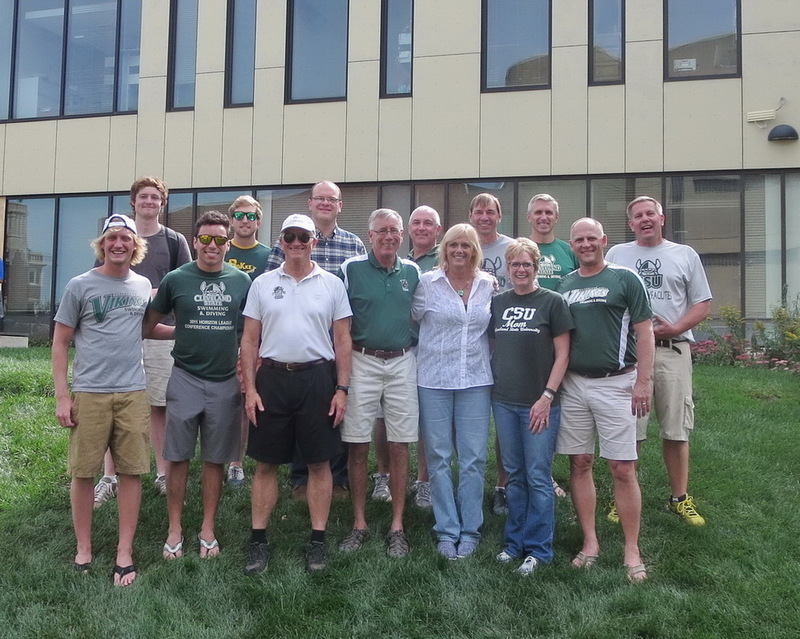 And dedication to the teams, CSU and the world of swimming. 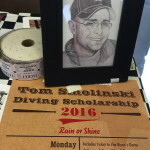 You understand the importance of preparation in all we do here in the pool, classroom and out in the community. You are the winningest coach in CSU history. 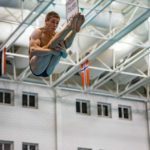 Most important – you truly love every swimmer and diver on every team you have ever coached (even those that were hard to love, even on training trips)”. The Heritage Project represents much more than pictures, websites and eye-popping graphics. We have created a platform for recruiting, fund raising and connecting. We know this lightning fast, world-class hall will continue to attract amazing women and men from around the world and down the street to become CSU swimmers & divers. And Leaders! 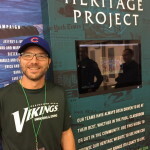 The Heritage Project will enable current and future alumni, and the University’s administration, to stay connected. 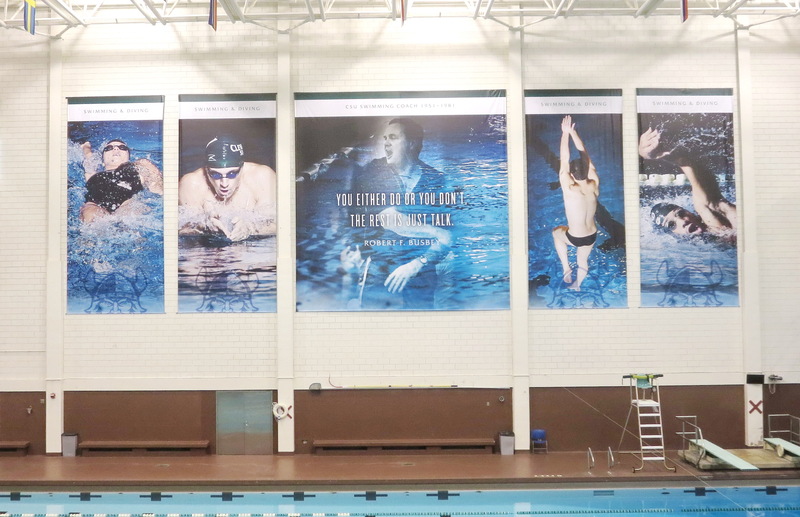 To expand support for CSU Swimming and Diving – whether it’s building new lockers, funding scholarships, recruiting top talent or writing new chapters to fill in the next 24 years on the Timeline Wall. In closing I would call your attention to the wording above the Heritage Corner. You can read this as two of our key values – TEAM is Forever, and EXCELLENCE in All We Do. As we look forward I like to think of it this way: Team Excellence is Forever In All We Do. 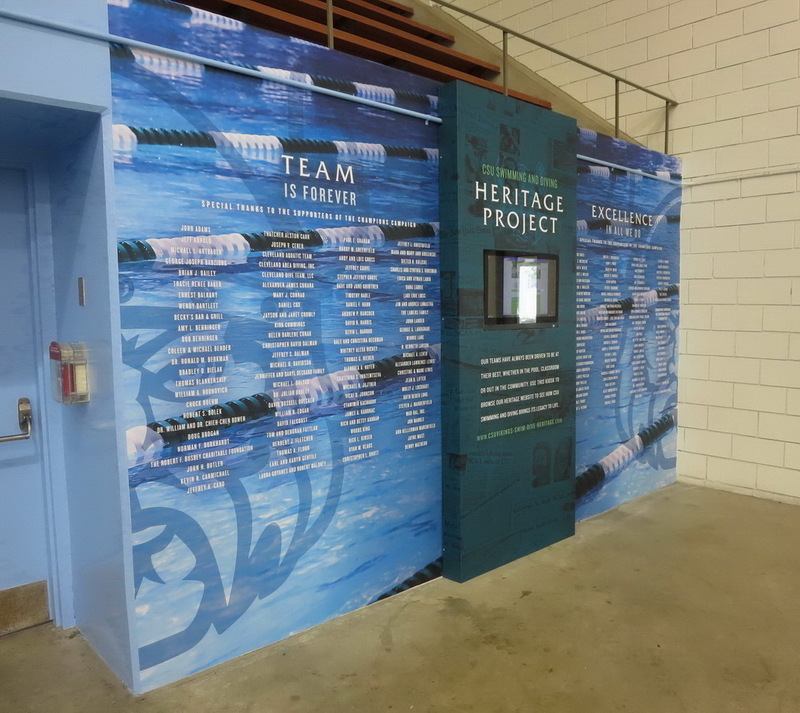 On behalf of Swimming and Diving Friends and Alumni from around the world THANK YOU again from everyone on the Champions Campaign and Heritage Committee who have worked since 2009 to make last weekend’s events a reality. Splash Bash Post-Script – The post-Splash Bash BBQ was clearly a huge hit with everyone, and a tradition we hope continues forever. As a committee we joked about “having our cake and eating it too”. This came true last weekend thanks to “CPG” and the current teams Moms and Dads [Private note to Brian Bailey – please thank your team for the tremendous parent/team/alumni BBQ and the special “turkey treat” that powered Wally and I through Saturday evening]. 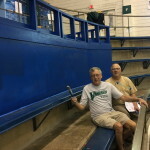 ” labor of love” as I used the teaching/coaching of both Bob & Wally to instill the same type of dedication & preparation in my 23 years as a high school Head Coach. To the many age-group & high school aquatic aces that I had the honor to instruct and coach @ Westlake, Orange, & Perry(Stark Co.) High Schools I wish you all the very best in your lives & future endeavors. 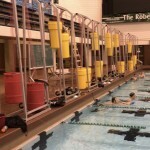 My CSU experience was made “richer” due to the swimming and diving team. I am forever indebted to those who coached and mentored me through my college years. The foundation you gave me has shaped not only my career in the field of education but also as a person, including wife, mother and friend. Thank you from the bottom of my heart for all that you have done on this project and for the impact that CSU Swimming has on so many lives from the past, current and future. It was incredible to see how my time at CSU coaching the women was part of this project. Even better was to see Wally and Bob as the gateway to the future. 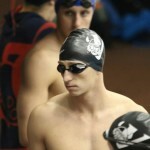 Once again CSU swimming is on the national stage. Thank you Wally! The updates look tremendous! However I did notice that there are at least two records that are not accurate. 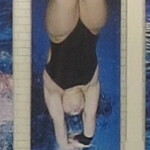 Hannah Stevens from Lexington High School set pool records in the Women’s 100 freestyle (49.77) and 100 backstroke (53.73) in February 2014.